I’ve written a couple times before about online dating (Online Chemistry, Research Paper), and while I’ve subscribed to a few dating sites, none of them have really led to any actual dates. For one thing, most seem to demand a fee for service to actually interact with anyone more than just on a superficial level… which is fine, people are in business to make money. And to be honest, I hadn’t really found anyone interesting enough who was also interested in me enough to make me want to pull the trigger and pull out my credit card to subscribe. And so I had really stopped going to any of them for the past few months. Recently two different podcasts I listen to brought up OK Cupid. I’m not sure why I didn’t check into the site before — I seem to recall reading someone saying that it catered to a much younger crowd maybe? — but the folks I was listening to spoke very favorably about the site, so I took it as a sign maybe I should check them out. I’m glad I did– I really like what I found there. For one thing, there is no subscriber fee other than a “premium” version with a apparently a few more bells and whistles, additional search capacities, but the free side is still very functional and useful, letting you chat with whomever you want (provided they want to chat). 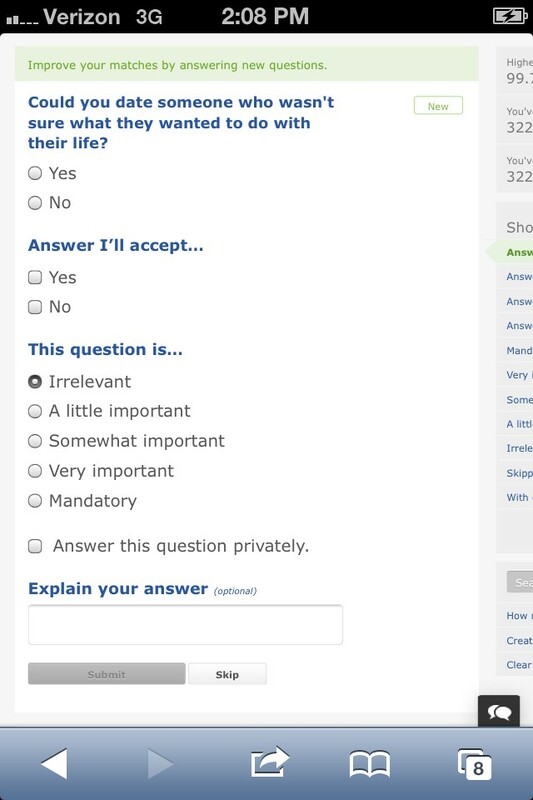 Much like the other sites, you set up a profile telling a little bit about yourself and what you’re looking for, load some pictures… but the part I really like about OKCupid are the questions it asks of you that drives its matching engine. There’s a minimum amount of questions to answer to prime the matching engine — I think around 20 — but the questions are pretty basic stuff, yes/no or a few multiple choice, and then you get to choose which of the available choices are acceptable in your match, and then you get to rate how important the question is to you (ranked from Irrelevant to Mandatory). There’s even a little text box where you can expand on your answer. So you start with 20 or so… but there are thousands and thousands of questions to answer! Some are silly, some are deep, some are dumb, but most are pretty fun. I’ve answered over 300 questions so far and there are thousands more. I could see spending all afternoon answering these questions. Here’s one I haven’t answered yet… I think it’s a tough one. I mean, first I thought about me — what do I want to do with my life? I mean, I can think of goals, I can think of dreams… The question seems to suggest that a person is either driven or aimless, and I don’t personally feel I fall strictly into either slot but rather somewhere in between. Who am I to judge someone else in that regard? See, the questions are interesting! On the one hand, this chart really flatters! 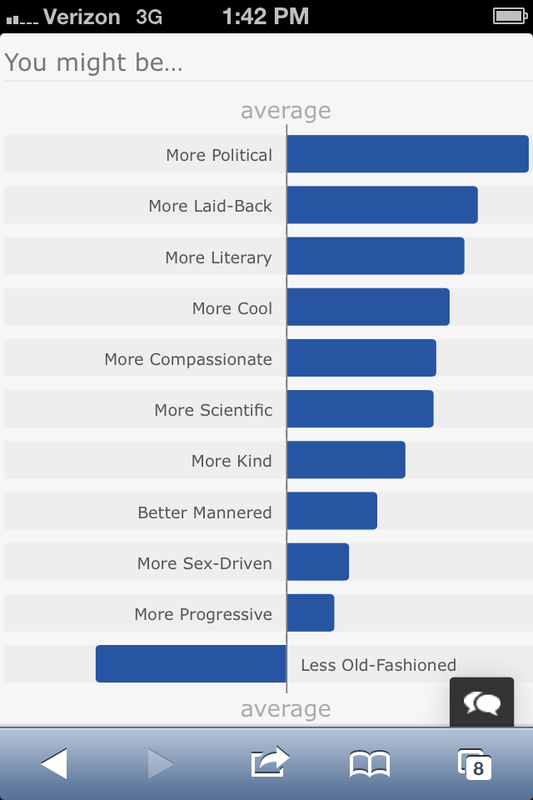 It says that I am (or rather, “might be” — hee, I like the legalese qualifier there), compared to the average, More Laid-Back, More Literary, More Cool, More Compassionate, More Kind… awww, shucks OKCupid you’re making me blush! And it makes me wonder how in the world does a computer figure out how cool, compassionate or kind someone is from these questions. See– interesting! On the other hand though, the length of the bars from the average pushes me out to the margins, which could suggest it might be tough to find a good match out there. Of course, questions and answers aren’t everything, and there’s a lot to be said for great profile essays and a willingness to chat to get to know each other better. If I ever have the desire to look for love out of country, OKCupid was even kind enough to let me know where I should go, and where to avoid! So I’m curious about other people’s experiences with OKCupid. I’ve only been on two weeks but I really like what I’ve seen! You make me wanna sign up lol! I’m one who had dismissed OKC as a site for old people. Sort of like e-harmony. But from reading your article, seems pretty cool and has a variety. Why the emphasis on online dating though, opposed to meeting girls on a day to day basis in your personal life? And you should totally sign up and check it out. If nothing else, the questions are fun! I’ve not heard of it, but I think it looks great for you. Have you set up any dates yet? 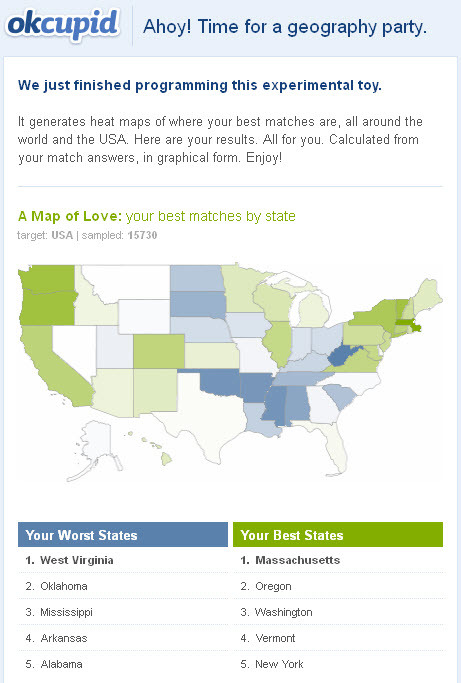 I met my wife through OK Cupid. Took about a month. Highly recommended from me. 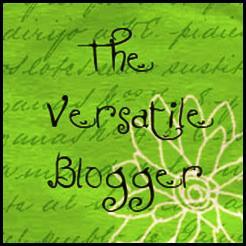 I was given your blog site by a friend….I enjoyed reading many of your blogs and was very impressed with your thoughts. Good luck with the online dating site. One of my sisters met her husband that way.